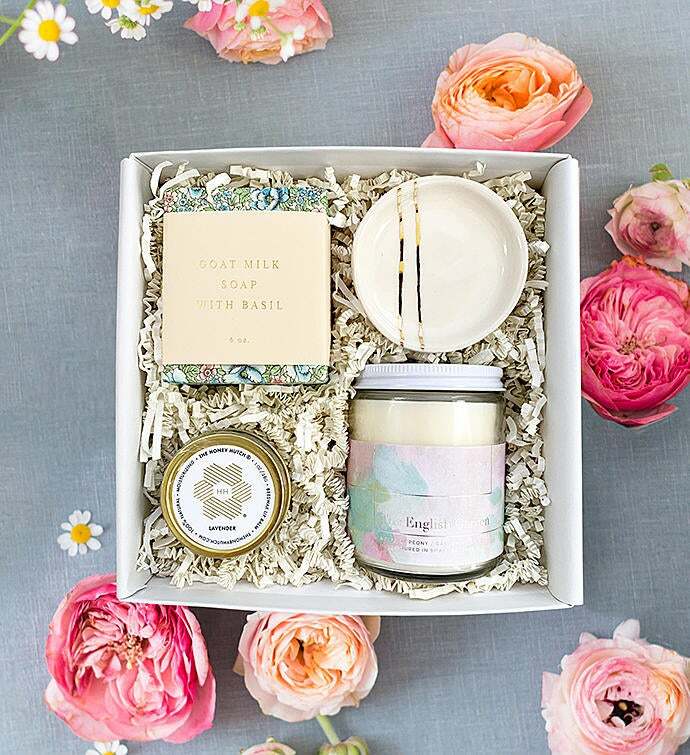 This gift is inspired by long afternoons relaxing on the back patio, enjoying the fragrance coming off the flower garden and the gentle summer breeze blowing through the open windows. With the prettiest floral soap we've ever seen, natural beeswax lip balm and a candle that smells like you have your very own backyard lavender patch, this gift is Summertime in a box ! Goat milk soap with basil, Honey Hutch lavender lip balm, Hand made ring dish by Honeycomb Studio, The English Garden (peony, gardenia & lilac) scented candle. Packaged in our signature pale grey gift box with a custom silver embossed white band. Perfect for: housewarming, birthdays, bridesmaid gifting, or for anyone in your life who loves warmer weather! This gift hits all the right (floral) notes for anyone looking to beat the winter blues or stretch out the final days of summer.